Today we are pleased to welcome the Oakland Schools AAC Team to share their expertise around providing instruction to classroom staff to help staff integrate AAC throughout the school day. We are a team of four full-time AAC consultants at Oakland Schools who currently support approximately 1100 students (birth through 26 years of age) who have complex communication needs in 28 local school districts in Southeastern Michigan. We support districts through consideration processes and the distribution of equipment as well as support strategies for implementation. Although the history of AAC at Oakland Schools is long (going back 40 years), our current journey began several years ago with an overriding goal that all students in Oakland County will become competent communicators. With this goal in mind, we designed a framework that provides local district staff the shared knowledge, content, and tools to effectively understand what a competent communicator looks like and how to develop communication and language with students who use AAC. Based on our experience and research, we recognized that we were not making our desired impact using the traditional sit and get model of professional learning. Our team chose to move from an expert to a collaborative model to support implementation and build sustainability. Therefore, we decided to explore a research-based implementation model. Job embedded professional learning (JEPL) allows us to systematically provide coaching and structured feedback to our local districts. 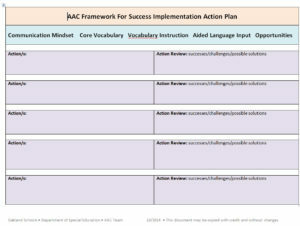 As part of our journey, we created a framework for success that includes a foundational series that provides shared knowledge and underlying principles of AAC implementation. Five 2-hour sessions during the school year allow us to introduce various aspects of the implementation strategy toolboxes from the framework for success (i.e., developing a mindset, core vocabulary, vocabulary instruction, aided language input, communication opportunities). These sessions also provide opportunities for discussion, interactive sharing, and engagement in an action plan. This foundational series is a prerequisite to our next tier of support, JEPL. Job embedded professional development is an effective research-based method that integrates theoretical content with practice of learned skills within the classroom and structured coaching over time. During job embedded professional learning, staff are actively engaged with both the content and other learners or coaches, with a focused goal of changing a teaching skill or practice to ultimately improve student achievement. Desimone outlines several of these core features within her framework looking at critical features of effective professional development (Desimone, L. 2009). Additionally, the National Staff Development Council has included Job Embedded coaching as an element in the definition of professional development to support the transfer of new knowledge and skills to the classroom. (Hirsh, S. 2009). Based on current research models, we developed our JEPL into two different phases to meet the growing needs of those in the county. The first phase was designed to support participants from our foundational series who wanted to implement newly learned concepts but needed some structure and feedback in order to put effective practices into place. Mentoring and instructional coaching in the classroom setting. Supports the implementation of a core vocabulary approach for students with complex communication needs. Designed for collaborative and active learning. Multiple sessions throughout the school year resulting in cycles of continuous improvement. The second phase of JEPL was designed to meet the needs of those who had already participated in Phase 1 and wanted to dig deeper into how to build capacity within their own district or collaborate with other districts. Part of our intent as a countywide AAC team was to begin to develop local leaders to influence and support their colleagues. Focus is on influencing others and building district leaders in the area of AAC. Providing ongoing support through resources, tools, mentoring, and coaching. Supporting local district projects and initiatives (e.g., presentations, development of on-demand modules, collaborative efforts, PLCs) led by district teams. The JEPL team must consist of at least an SLP and teacher who are supporting students using AAC. Teams have also consisted of OTs, PTs, social workers, paraprofessionals, and others. During the initial meeting with the team our goal is to develop a schedule and set the norms and expectations of what a JEPL looks like. We want the participants to understand that this is a shared ongoing process which requires active learner involvement during the day-to-day teaching practices. Time commitment is 4-6 contacts a year for a minimum of 90 minutes. 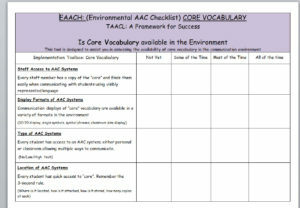 This Environmental AAC Checklist is used to help teams assess the availability of core vocabulary in the communication environment. We expect participants to complete and use the Environmental AAC Checklists (EAACH) which we created to help determine their current state and identify which areas could be focused on during a JEPL. We also use an additional observational form to help staff think deeper about their students’ current communication by asking questions related to communication topics, partners, and frequency as well as specifics about those communicative acts. The Action Plan is an integral component of the JEPL. The district team uses this plan to identify an action/s they would like to target and focus on during coaching interactions. It is important that the district staff choose these goals themselves based on where they see a need for support and would like to make change. Structured observations are scheduled 4-6 times a year for the AAC consultant to observe within the educational setting and provide feedback based on the action plan. During coaching sessions, the consultant provides feedback and resources to the team based on the chosen actions during or immediately following the observation. Typically after the observation session there is time scheduled to meet with the entire JEPL team to debrief, provide feedback, ask questions, and re-visit the action plan. During this time we will also determine next steps for the following observation/coaching session. Foundational learning and 2 years of JEPL. Used the EAACH tool to assess current state over time. Making core visible and accessible to all students. Staff use of aided language input across the day. Explicitly teaching core vocabulary words. Overall increase in use of functional communication tools by all students. Increased demonstration of functions of communication. Increased use of core vocabulary across the day. Increased parent support and use of core at home. Use of aided language input throughout the school day by staff across environments. Explicit vocabulary instruction of core words using a word of the week/day structure. Team approach and consistency of materials between all classrooms/staff. Used the EAACH tool, My Observation Checklist, and structured observations/videotaping. Expanded use of multiple word classes. Direct modeling and teaching of morphological endings. Ability to use language to learn. Increase in silent reading with comprehension. More spontaneous social communication in the classroom. Confident and engaged teachers and students. High expectations and low standards. Supportive environment for communication and learning. Increased risk-taking in the learning environment. Making powerful change is hard work but can be accomplished through a well thought-out plan, perseverance, and a collaborative team approach. Remember Laozi’s words: “A journey of a thousand miles begins with a single step.” It is worth it in the end. Croft, A., Coggshall, J. G., Dolan, M., & Powers, E. (2010). Job-embedded professional development: What it is, who is responsible, and how to get it done well [Issue brief]. Washington, DC: National Comprehensive Center for Teacher Quality. Joyce, B. R., & Showers, B. (1981). Transfer of training: The contribution of “coaching.” The Journal of Education, 163 (2), 163-172. The Oakland Schools AAC team consists of four full-time staff who have a variety of backgrounds and skills. These team members have experience in autism, physical impairments, multiple needs, cognitive impairments, early childhood development, and apraxia as well as typical language and literacy development. The members of this team bring different strengths to the effort to support the unique needs of students and staff across all 28 districts. The collaboration between team members ensures that the staff can provide research-based strategies to support the growth of competent communicators across Oakland County, MI. The team members have no financial or nonfinancial relationships to disclose. Hi My daughter uses AT (Accent 800 84 grid) to communicate and an iPad to write her knowledge of her curriculum. She is a 6th grade regular ed. student. The apps she uses are Notability , Math Paper, Student Chrome, Google Drive Learning Ally Link. Our problem is that she cannot save her work to any subject folder. When we want to work on an assignment we spend a lot of time scrolling through all the work previously done or started. There is no order to the work at all, not even date order. The AT support say they are looking into sorting it out but so far nothing. My daughter has CP and is non verbal, has limited gross and fine motor skills and has had almost no training with these apps. She only received them this school year with the exception of Math Paper which she got in 5th grade. I am concerned that she is not getting the help she needs to learn to use these apps.She is very bright and according to her teachers has the potential to go to college, if we can get her to be more independent at expressing her learned knowledge of her curriculum. I have an IEP annual review coming up and I would like to get her direct AT service to help her. Her teachers and one on one admit that they are struggling with her technology too. We would really appreciate any advice you can offer.